Civil and transportation engineering professionals can plan, design, evaluate and visualize their roadway and highway projects with greater efficiency than ever before. From new road construction to rehabilitation work, our flexible solutions accelerate the design process for Roads, Junctions (Intersections) and Roundabouts. TORUS® gives you the right tools to design roundabouts smarter and more efficiently. It generates initial geometry honouring reference criteria and provides real-time feedback regarding recommended dimensional and analytical ranges. Make edits to your design parameters and get instant feedback during the process. Powered by the trusted AutoTURN® engine, TORUS® uses the Vehicle Envelope Method® (U.S. Patent No. 8,650,004) of design to generate roundabout geometry with vehicle swept paths. This innovative approach allows for real-time, interactive designing and dynamically updates any changes made to the entire roundabout layout. Engineers with all levels of roundabout design experience will find TORUS invaluable during all stages of the design project. NEXUS® is the ultimate intersection design solution for new construction and rehabilitation projects offering vehicle operations, geometric design, and safety performances together in one comprehensive package. 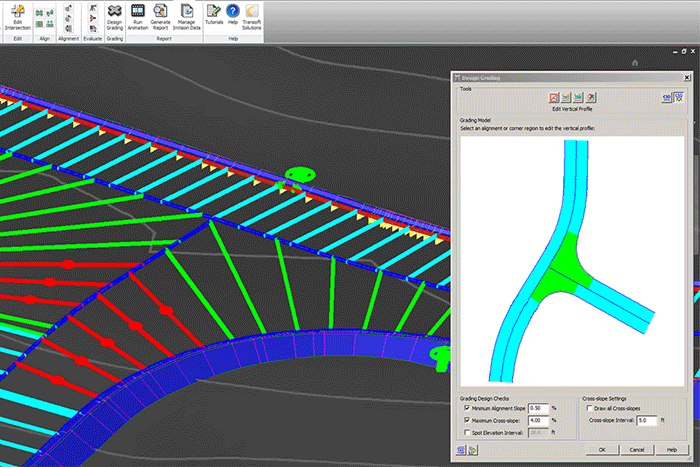 With 65% savings in overall design costs, NEXUS allows for the creation and evaluation of intersection concepts in a fraction of the time compared to traditional or manual computer-aided drafting and designing. Using the Vehicle Envelope Method® (U.S. Patent No. 8,650,004) of design, NEXUS incorporates all the key elements in the intersection design process including design vehicles, capacity conditions, sight lines, conflict points, and conceptual grading – providing instant feedback so engineers can quickly and easily produce highly effective and safety-oriented intersection layouts.